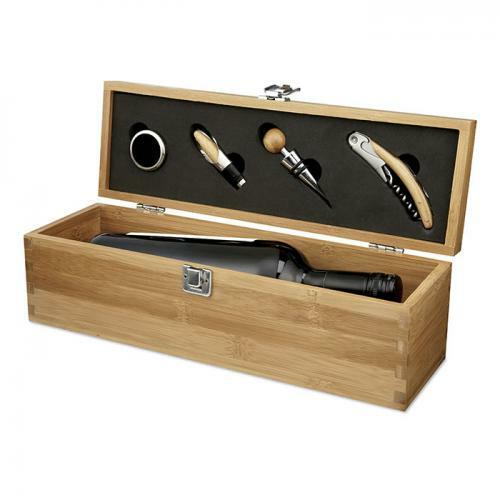 A superb wine accessories gift set offered at a very affordable price. These sets comprise a wine bottle sized box (bottle not included) in bamboo wood finish with hinged lid and brass-coloured lock. Inset into the lid are four accessories - a drip collar, pourer, bottle stopper and corkscrew. These sets can be customised by laser engraving into the lid of the wood box, a process that leaves a clean, crisp and very high quality impression. Branding via engraving is provided free of charge, allowing you to create corporate gifts or promotional merchandise with these very attractive wine box gift sets.